As a great man once said, life moves pretty fast. Anything that saves you time is a godsend, freeing you up to do whatever else you value in life. Which is where the GamesRadar newsletter comes in. Everyday it brings the biggest games, movies and TV news straight to your inbox, so even if you don't have time to browse feeds or check your social, you'll still be up to date with what's going on. AND, most importantly, you get free stuff: namely a lavishly crafted ebook of your choice worth £15.99/$26.99. 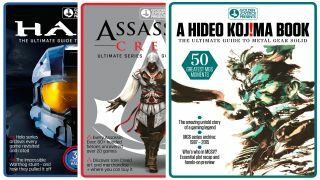 You can choose between an Ultimate Guide to Metal Gear Solid, Assassin's Creed or Halo, presented by The Golden Joystick Awards (the international video games award show). Each one contains 148 pages of history, facts and interviews about each series full of insights and stuff you might not have seen before. So, TL;DR: get an amazing free book and all the latest games and entertainment news to your door just for signing up. So do it! We hope you enjoy the GamesRadar+ newsletter, and you can also keep up to date with all the latest games and entertainment news by following 8 Things to Watch Out For This Week (live on the homepage at 9am PT / 5pm BST every Friday).